As cars become more sophisticated, you’re now able to access all sort of data from your car and display this on a computer or tablet to diagnose problems or simply to create your own high-end dashboard. This morning, I’ve come across CARAPP APP327, a Bluetooth diagnostic scanner compatible with OBD2 standard (On-Board Diagnostic II), which could can just connect on an OBD2 connector if your car is recent enough. This has been around for many years (since 1996), but I had never heard about this technology until today. Wikipedia OBD2 page explains the OBD2 connector (16-pins) should be within 2 feet (0.61 m) of the steering wheel according to the standard, which also specifies the type of diagnostic connector and its pinout, the electrical signaling protocols available, and the messaging format. After you connect the Bluetooth adapter, you just need to install the applications needed for your platform (e.g. 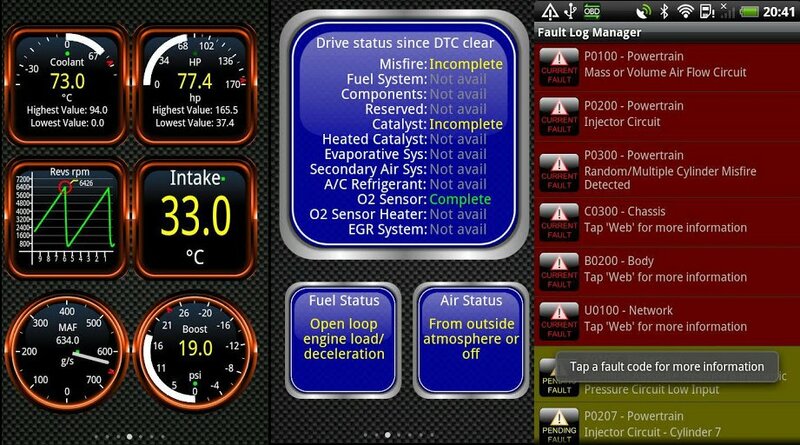 Android, Windows, iOS, etc…) which you can get from an installation CD, or download an application that supports OBD2 standard such as Torque Pro or Torque Lite for your Android device. Function – Read trouble codes, check trouble codes, display current sensor data, calculate fuel oil consumption. The device can report the engine and vehicle speed, load values, the temperature of the cooling liquid, the fuel system status, short-term fuel adjustment, long-term fuel trim, the air flow rate, oxygen sensor voltages, fuel pressure and more. Since it follows OBD2 standard I would think it’s compatible with Torque Pro/Lite, but could not find specific demo videos for this particular device. I tried a Dealextreme OBD connector (with cable) on my Volkswagen, connected it to my Ubuntu, and got … nothing. Tried three different programs … nothing at all. I would love to have it running, but it’s not as trivial as I hoped. Do you mean USB cable or another cable? Maybe worth trying with Android if that’s the case. 1. The SW and the OS. The best OBD SW is unfortunately for Windows only. I’ve tried a couple till I got some good results. 2. Your car might not be OBD II compatible even if the slow is the same. I’ve read and seen some VAG units out there, maybe they’ll do a better job. I have one of the cheap $12 ELM-327 OBD2-to-bluetooth units from Amazon in my car. Paired with Torque on my Android phone, it’s a great combination. FWIW: I’ve ordered the 12 USD OBD-bluetooth connector. I’ll report back when it arrives. Any luck setting it up with your car? I can pair mine with pass 1234, but then it’s stuck with “Connected to ODB interface, querying” in Torque Lite.